For 15 seconds a year, Steve Buttleman is the most famous man in America. 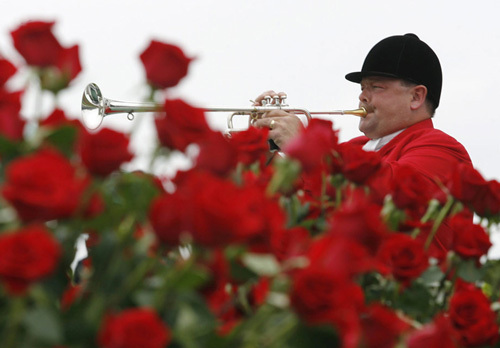 On the first Saturday of every May, wearing his famous red jacket and black cap, he marches from the white pagoda behind the Churchill Downs Winner’s Circle, lifts a bugle to his lips, and plays Call to post, cuing the jockeys to lead their horses to the starting gate. Buttleman plays for the spring and fall meets as well as the Kentucky Derby, often performing Call to post as many as eleven times a day. This according to “America’s most famous bugler” by Patrick Wensink (The Oxford American 1 May 2013; the article is here). Above and below, Mr. Buttleman’s 15 seconds of fame.